It took me longer than the Ima and it took me longer than Rebecca, but like the two of them, I recently read and enjoyed Road to Valor: A True Story of World War II Italy, the Nazis, and the Cyclist Who Inspired a Nation. Written by Aili and Andres McConnon, the non-fiction narrative that reads like a novel tells the story of Gino Bartali, one of Italy's great cyclists and a two-time Tour de France winner--first in 1938 and again in 1948, a time when sharp political divides (and fan loyalties) characterized the country. During the years in between, Bartali used his time and talents as part of a network of Catholic clergy and printers, all of whom risked their lives to create counterfeit documents so that Italian and emigrant Jews could remain in German-occupied Italy. Using his bicycle, Bartali ferried documents, rolled up and hidden in the frame of the bike, around the country--from Florence to Assisi and back again. The cyclist also was instrumental in saving the lives of the Goldenberg family--Elvira and Giacomo together with their son Giorgio and their daughter Tea. Without Bartali's assistance, it is more than likely that the Goldenbergs would have perished at the hands of the Nazis. Instead, the children and grandchildren of Giogio and his wife, and Tea and her husband today number more than two dozen. Reticent to elaborate on this facet of his life, Bartali "remain[ed] tight-lipped with the press about his wartime activities for most of his life." 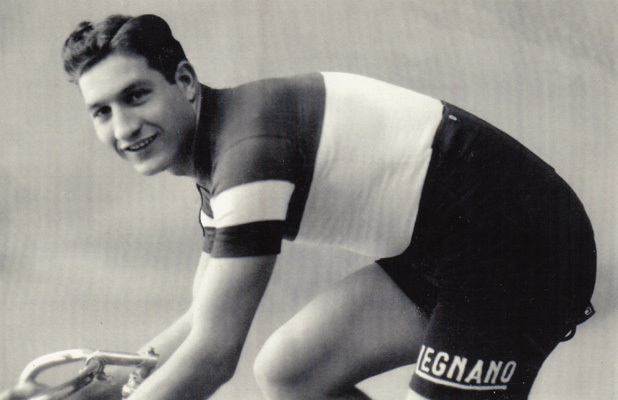 Thanks to the McConnons, we readers are all the wiser, knowing that for the life he lived and for the lives he saved, Gino Bartali is indeed a hero--to Italy and to the Jews.